Wednesday, December 7 – Business owners and residents alike all echoed the same sentiments — that neighborhood officers continue to make their presence felt in and around their communities. The Commissioner of Police Michael Matthews joined the officers in the months of October and November to meet those with whom the officers have built relationships. 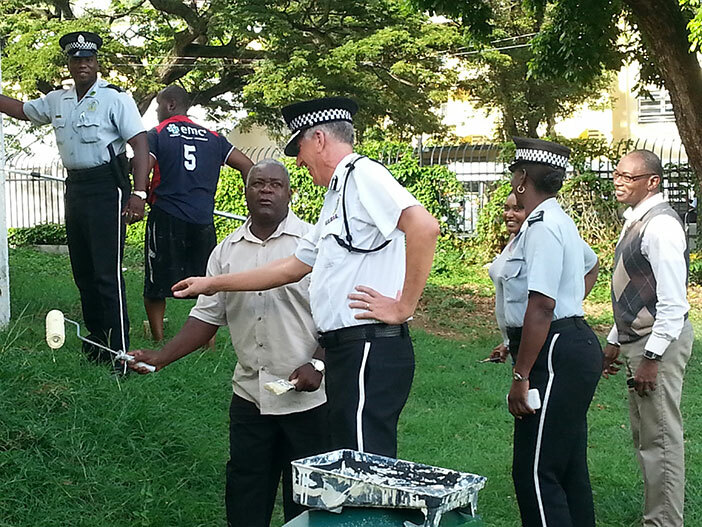 “I am quite happy to hear members of the community speak not only of the relationships built with our neighbourhood officers but that the partnerships resulted in clean-ups of recreation areas and the removal of graffiti where possible. These officers are to help home and business owners cultivate a love and protection for their communities and many persons are already engaged. I hope many more will do the same,” the COP stated. The Commissioner shared the well-studied and documented impact that clean and graffiti-free recreational areas have at reducing anti-social behaviour. “The broken window’s theory suggests that graffiti, poorly-maintained buildings and recreational facilities tend to generally elicit more criminal and other anti-social behaviour. I would like us to work together with communities to make sure that we do whatever it takes to build crime-free, attractive communities. He noted the support of both the Paint Factory in Port Purcell for the donation of paint for the Old Recreation Grounds and Recreation Trust in these efforts. Since Neighbourhood Policing was piloted in 2014, seven officers were assigned to various areas around the Territory under the supervision of Sergeant Tilda Henry. When the new recruits come onboard, Matthews hopes to make more officers available.